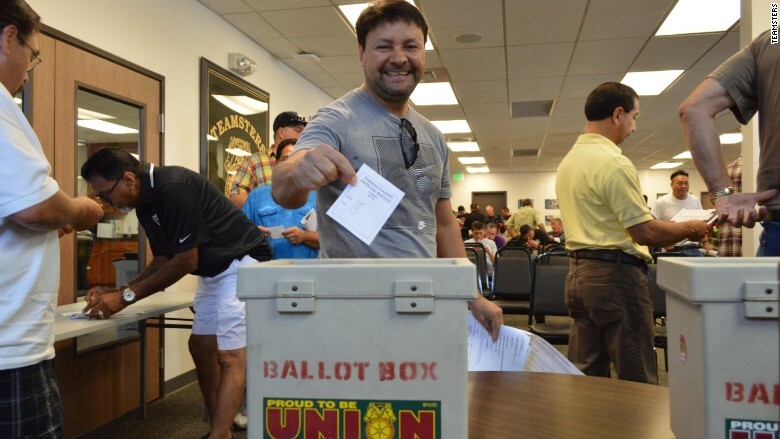 A driver represented by Teamsters Local 853 votes on a new contract for higher wages. Bus drivers for big tech firms want more. Five months after unionizing, 75 bus drivers voted Saturday for a proposal that would increase their wages to $27.50 and provide them with new benefits. These drivers are all employed by a firm called Compass Transportation, which services seven companies: Apple (AAPL), eBay (EBAY), Yahoo (YHOO), Zynga (ZNGA), Genentech, Amtrak and Evernote. They're represented by Teamsters Local 853 in San Leandro, California. According to Rome Aloise, international vice president at Teamsters, the pay increase is significant bump from the $17 to $21 an hour they're currently making. Under the proposed three-year contract, base rates will start between $25 and $27.50. That base will increase by 75 cents each year. The contract also addresses drivers' scheduling concerns: split shifts (drivers who work several hours in the morning and return to the depot for several unpaid hours before working an evening shift), as well as calls for employer contributions to a defined pension plan. The vote comes after five months of negotiations between Teamsters and Compass to complete the contract. "We agreed to be flexible on their client needs but inflexible on changing anything that was economic," said Aloise. "I think the negotiations went great ... It seems to be a very affordable contract [for] some of the richest companies in the world." Now, each of the companies must sign off on it. If approved, over 160 drivers will see a wage increase. CNNMoney reached out to the companies for comment. Zynga and Yahoo declined to comment. Genentech said it is on board with a wage increase. "We support implementation of the higher wages offered to its employee union effective immediately," a Genentech spokesperson wrote in an e-mail statement. Teamsters successfully implemented a similar contract with Loop Transportation -- which services Facebook (FB) -- in February. Aloise said it took several weeks for Facebook to sign off. In July, 140 workers at Google Express announced that they'd also voted to be represented by Teamsters. Employees of Adecco, they are asking for improved working conditions. In San Francisco, the buses used by major tech firms are a reminder of the area's inequality. Tech's high-paid workers are driving up rents, while working class tenants are pushed further out of the city as they struggle to afford the skyrocketing rents.